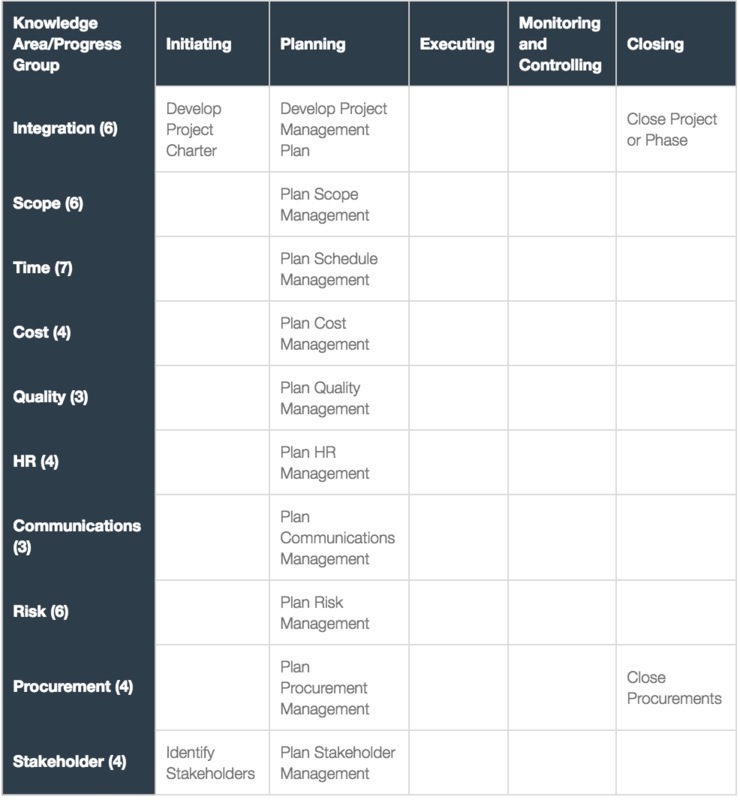 The PMP Process Chart is the backbone of the PMBOK guide. 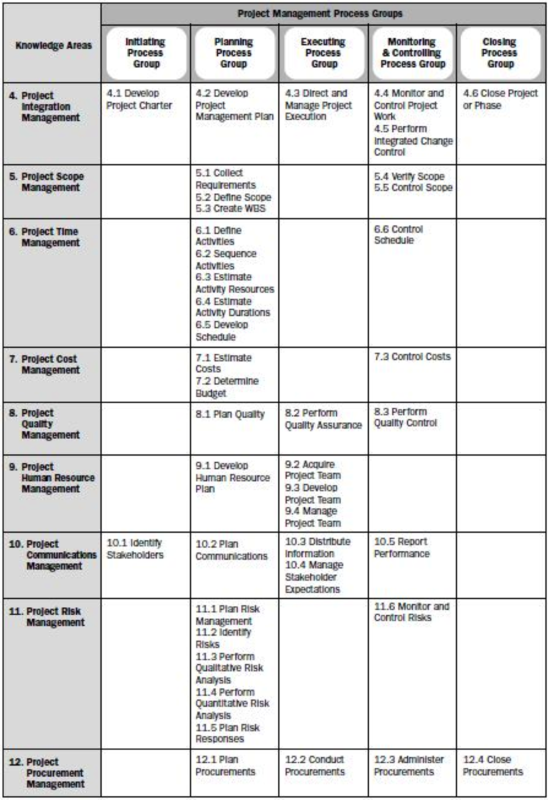 Each chapter of the PMBOK expands on each row or Knowledge Area in the Process Chart. Thus, it is essential that you have this chart memorized before your exam. One of my top tips for taking the exam is to draw out the Process Chart using the 15 minutes you have before your exam starts. This way, you can reference the chart whenever you need to during your exam. Here’s an article on how to draw out your cheat sheet before your PMP exam. In this article, I will cover how to can memorize and draw the PMP Process Chart in under 3 minutes. First, using a legal sized paper, you want draw a table with 6 columns and 11 rows. You may be wondering, why can’t I just practice drawing this on excel? The answer is that you won’t have access to excel during your PMP exam, so you want to get familiar with using pen and paper. By drawing it on paper you can control how big or small your fonts can be. 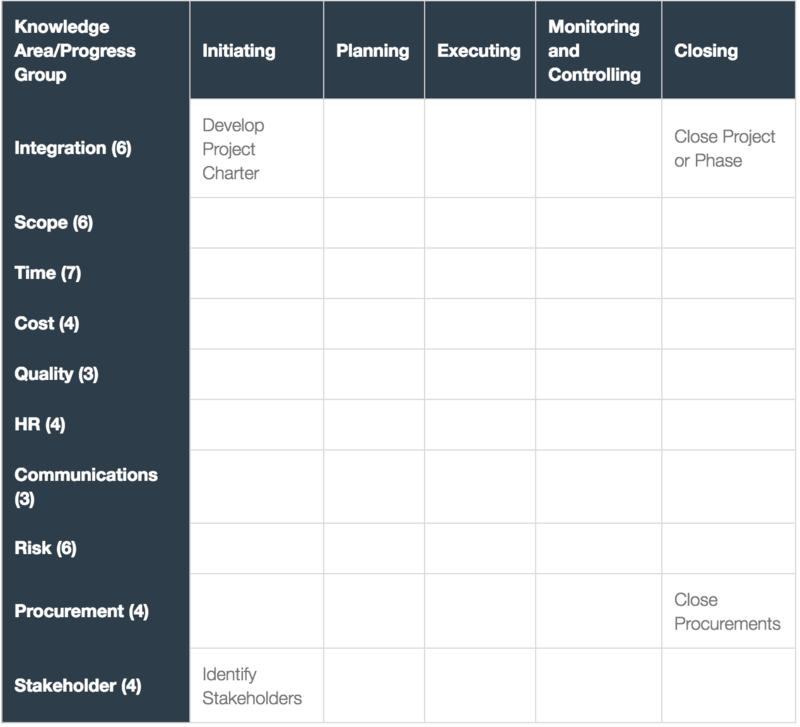 Along the top row, you want to write out your 5 Process Groups, which are Initiating, Planning, Executing, Monitoring and Controlling, and Closing. A quick way to memorize this is by using the rhyme “In Physical Education Mary Cries Constantly.” The first letters of this phrase matches with the first letters of the 5 Process Groups. Here’s 6 other rhymes to help you memorize the 10 Knowledge Areas (just in case you didn’t like the one above). There are 10 processes that begins with the word “Plan,” and they all fall in the Planning Process Group. Fill them into your process chart now. Similar to what you did in step 4, fill in the “Estimate” processes into the Planning Process Group. For example, Estimate Activity Resources is filled in in the intersection between Planning Process Group and Time Management Knowledge Area. Next, fill in the 4 processes that begins with the word “Perform.” Unfortunately, they do not all fall within the same process group. Fill in the 5 “Develop” processes now. 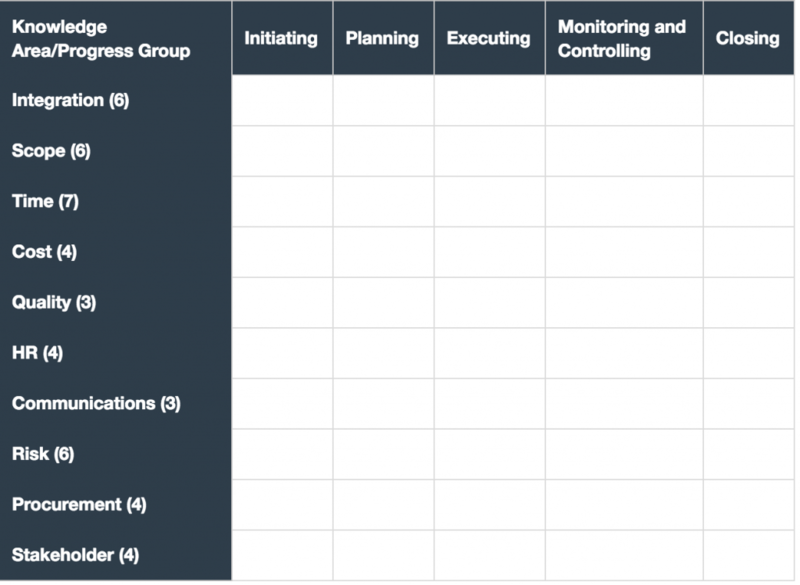 There are 10 processes on the Process Chart that begins with the word “Control.” As its name would suggest, all of these processes fall within the Monitoring and Controlling Process Group. Fill these in now. There are 3 processes that begin with the word “Manage” and they all fall under the Executing Process Group. Unfortunately, the other processes in the PMBOK does not start with a keyword or follow any particular pattern. With practice, though, you will have them memorized. How do I read and understand the PMP Process Chart? Glad you asked. In our daily lives, we are used to reading things from left to right, but when it comes to the PMP Process Chart, you need to read it up and down for it to make sense. In other words, you read all of the processes in the Initiating Process Group from top to bottom, then you read all the processes from the Planning Process Group from top to bottom, and so forth. Once you realize this trick, studying for the PMP exam will become easier.